It’s no surprise that kids are less active then they used to be when it comes to outdoor activities. With all of the electronic devices and video games available to them, many kids would rather spend their summer on the couch, in front of the TV rather than doing something physical, outside in the heat. One way to combat the inevitable couch potato in your house is to give them something exciting to do while they are outside. 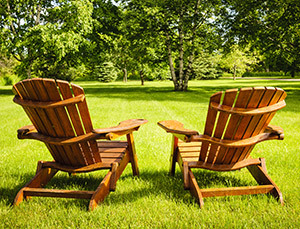 A swing set might be just the thing they need to get them going and get some exercise. And with the Flexible Flyer Triple Fun II Metal Swing Set kids will have three times the fun than they would with just a stand-alone slide or a rope swing. 1 What Does the FF Triple Fun II Look Like? 2 How Big is the Flexible Flyer Triple Fun Swing Set? 3 What is Needed for Assembling the Triple Fun II? 4 Where Can I Purchase this Swing Set? What Does the FF Triple Fun II Look Like? The Triple Fun II is constructed around a four-leg frame that is ivory in color and made of metal. It is a great starter set for younger kids, but can keep the older kids busy as well. Perfect for smaller backyards and great for those who do not want to spend a lot, this swing set comes with four different methods of play. The Triple Fun II comes with two child comfort seat swings. These are your most basic swing and are constructed of a hard plastic that is curved for comfort. These swings are easy to attach and come with vinyl covered chains that can be adjusted to accommodate different sized kids. 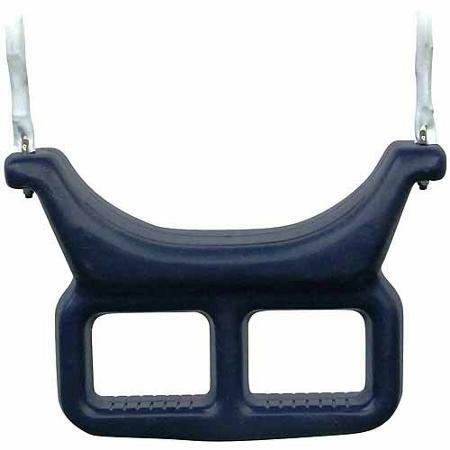 The comfort seat swings are an attractive midnight blue color. The shoe loop swing is a unique feature that cannot be found on many other playsets. This swing allows kids to stand while they swing. Face it, they will unsafely try to stand on a regular swing anyway, so this accessory makes it safe to stand while they glide through the air. 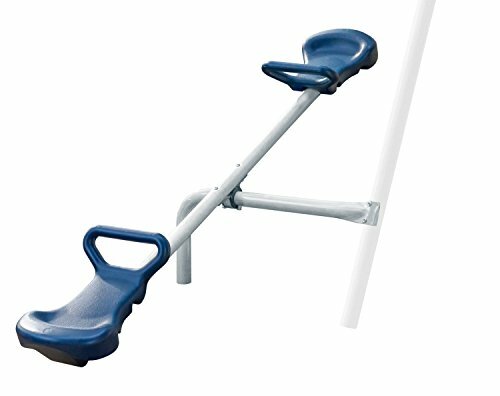 This unique feature is what makes this set different from the FF Triple Fun, which comes with 3 comfort seat swings instead of a shoe loop swing. 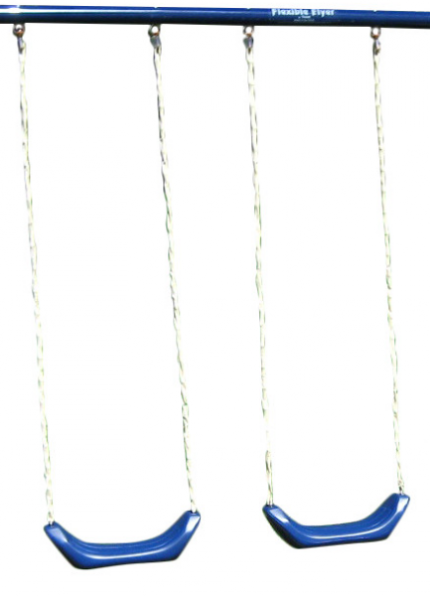 This swing is also constructed of midnight blue hard plastic and is equipped with vinyl covered, adjustable chains. It’s not often that you see a see-saw actually attached to a swing set, but it is on this set. Small enough for even the youngest kids in your family to enjoy, the see saw is built around a metal frame that can be left off if you are limited on space. The seats and safety handles are hard plastic and match the midnight blue color of the swings. 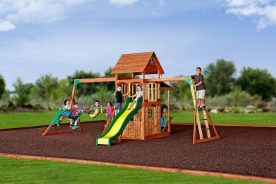 Perhaps one of the kids’ most favorite accessories, this swing set includes a 6-foot-long wave slide. The slide is easily accessible with only two steps to climb and is approximately 4 feet from the ground. It also comes in midnight blue and even with its dark color it surprisingly does not get hot in the sun like many other plastic slides tend to do. How Big is the Flexible Flyer Triple Fun Swing Set? 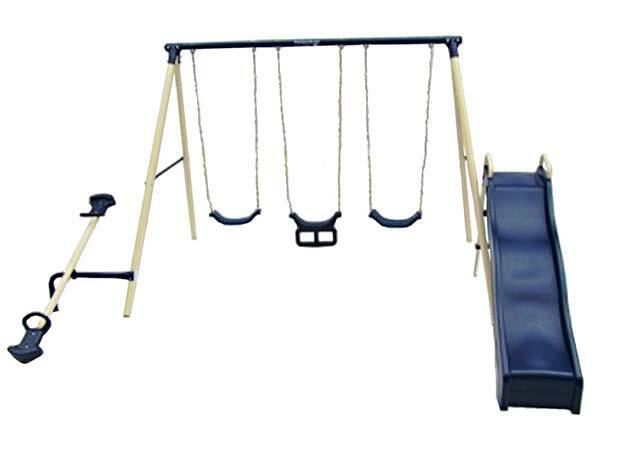 The Triple Fun and Triple Fun II swing sets are the same size. Either one is designed to fit a smaller yard space while still giving the kids plenty of play options. 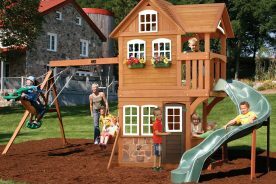 Once it is constructed, the swing set is 119 inches long x 96 inches wide and is 72 inches high. For safety reasons it is recommended that there is a 6 – 12 foot perimeter around the playset. When you pick it up at the store or have it delivered to your house, this set comes completely disassembled in a cardboard box. The box is 7 feet long and approximately 18 inches wide and 10 inches deep. It weighs 70 lbs. so it is recommended that two people carry it. Since there are 6 places to sit on the Triple Fun II, the maximum number of children that can play on it at once is also 6. It is recommended that the maximum weight for each child be 105 lbs for a combined weight of no more than 630 pounds. What is Needed for Assembling the Triple Fun II? Assembly of this swing set is designed to be very simple and easy to do on your own. With two people assisting each other it typically takes about 1 ½ – 3 hours to complete. Everything you need to complete the set is included in the package including a detailed instruction manual, all of the required hardware, and four ground anchors. Where Can I Purchase this Swing Set? If you are in the market for a budget-friendly, mid-sized metal swing set, one from Flexible Flyer is an excellent option. 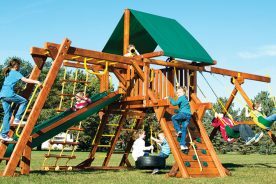 The Triple Fun II has something for every kid in the family and is a sturdy and reliable swing set. It also comes with a 180-day limited warranty and excellent customer service from the manufacturer. They are willing to help with any missing or damaged parts as well as answering any questions you may have. Check out other Flexible Flyer models here.